A Team of five (5) visited the First Lady as a pre – World Mental Health Day planning activity. Major updates were the formation of the Mental Health Coalition of Sierra Leone and the need to have the Mental Health Policy and the Strategic Plan launched. The launching of the above documents was warmly accepted by the First Lady to be done on the 10th October (World Mental Health Day). 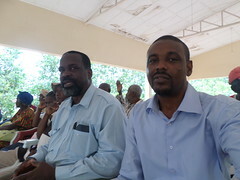 Sierra Leone launched its National Mental Health Policy and Strategic Plan at the commemoration of World Mental Health Day on 10 October 2012. The documents and the commemoration were launched by the First Lady of Sierra Leone, Mrs. Sia Nyama Koroma in a function attended by government functionaries and non-state actors including UN agencies and other development partners, mental health advocates, the civil society and the media. Delivering the key note address, Mrs. Koroma stated that mental health is still largely a neglected problem with a high social and economic impact. She described the occasion as an opportunity to demonstrate support for people affected by mental health disorders. “We must commit ourselves to improve the lives of people impacted by mental disorders, and join the global fight for mental health”, she added. The Deputy Minister of Health and Sanitation Mr. Tamba Borbor Sawyerr reiterated the need for a concerted effort to address the burden of mental health in the country. The WHO Representative, Dr Teniin Gakuruh who delivered the message on behalf of the WHO Regional Director for Africa on the occasion, called on Member States to increase support to mental health programmes by “allocating adequate human and financial resources for responding to depression”. 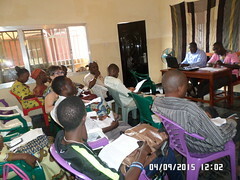 The same was emphasized by Heather Weaver, the Project Coordinator of the Enabling Access to Mental Health in Sierra Leone in her statement. Firstly, it gives the opportunity to show solidarity and support to the hundreds of millions of people worldwide who suffer mental disorders of various types. Secondly, it is focused on the achievement of having two important documents (the Mental Health Policy and the Mental Health Strategic Plan) launched. These documents would serve as a guide in the building and running of a strong Mental Health delivery service in the country. The ceremony was concluded with a press conference which was aimed at facilitating sensitization and awareness through the media. Seventeen local press men representing different press houses were in attendance. The panel which was chaired by Joshua A Duncan (the Coalition’s Coordinator and mhLAP country Facilitator), had Dr. Gladys Palmer (Vice Chair of the Coalition and Director of NUWACH Outpatient Services), Dr. Andrew T Muana (Focal Point for Non- Communicable Diseases in the Ministry of Health and Sanitation-Sierra Leone and Superintendent of the Sierra Leone Psychiatric Hospital) and Mrs. Aminata Kobie (Mental Health Focal Person of the World Health Organization) in attendance. 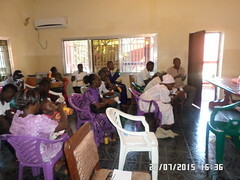 The different types and stages of mental illness and their corresponding effects were fully discussed. Also the intervention of the Mental Health Coalition of Sierra Leone, the government of Sierra Leone and the World Mental Health Organization included major among other issues discussed.